Bank Leu combines professionalism, security and discretion with leading-edge technologies, innovative products and a strong focus on performance. Barclays provides a full range of banking services. Offers a variety of financial services to non residents including to international high net worth individuals, delivery service and management of International Business Companies and Trusts, numerical accounts, term deposits, security trades, offshore mutual funds and credit cards (US dollar Visa Cards). The Citco Group is a financial service collective that offers a unique combination of services to protect, preserve, and enhance the assets of individuals, companies and institutions worldwide. The Corner Bank has a globally diversified strategy and takes account of risk diversification. Offers full Private Banking, trust and estate planning services. Credit Suisse (Bahamas) Ltd. is a wholly owned subsidiary of Credit Suisse Group thus enjoying access to global markets and to the resources of a world-wide organisation. Finter Bank Zürich provides international and domestic clients with all the advantages of Swiss private banking. A private Bank with a full, unrestricted Banking and trust license and a mutual fund administrators license to conduct business from the Commonwealth of The Bahamas. Hottinger is a family-owned group with a broad international presence, combining contemporary financial management techniques with traditional portfolio management values. Leadenhall is the oldest privately owned bank and trust company in The Bahamas. A Bahamian financial institution where 80% of the shares are Bahamian owned. Since it was granted a bank license in 1998, the company has doubled in size, offering expanded opportunities for individuals worldwide. Lombard Odier Darier Hentsch Private Bank & Trust Ltd.
Oceanic Bank is wholly owned by The Teekay Foundation. Incorporated in 1982, Oceanic Bank currently has an unrestricted bank and trust company license by the Bahamian Minister of Finance. Pictet has a wealth of experience covering all aspects of international investment, a skill that requires in-depth knowledge of markets from around the world. A full service international private bank offering a variety of services tailored for high net worth, sophisticated investors and corporate institutional clients. SG Hambros is a private bank providing a comprehensive wealth management service. The Private Trust Corporation Limited ("PTC") is a Bahamian licenced bank, trust company andÝ mutual fund administrator. Thorand offers a wide range of fiduciary services including the administration of trusts and related services, managed companies, portfolio administration, and securities transactions, in addition to banking services. With head offices in Zurich and Basel, UBS operates in over 50 countries and from all major international financial centers. Their global physical presence is complemented by offering clients products and services via a variety of different channels – from the traditional retail bank to sophisticated, interactive online tools. Winterbotham is a bank and trust company and fund administrator offering financial, fiduciary and corporate services to institutions, entrepreneurs and companies. 3 BAC BAHAMAS BANK LTD.
9 BANCO ATLANTICO (BAHAMAS) BANK & TRUST LTD.
10 BANCO CCF BRAZIL S.A.
12 BANK OF BUTTERFIELD (BAHAMAS) LTD.
13 BANK OF NOVA SCOTIA—SCOTIABANK (BAHAMAS) LTD.
14 BANCBOSTON TRUST CO LTD.
15 BANQUE PRIVEE EDMOND DE ROTHSHIILD LTD.
16 BANQUE SCS ALLIANCE (NASSAU) LTD.
18 BSI (OVERSEAS) BAHAMAS LTD.
19 CITCO BANK AND TRUST COMPANY (BAHAMAS) LTD.
22 CREDIT AGRICOLE SUISSE (BAHAMAS) LTD.
24 CUSCATLAN INTERNATIONAL BANK & TRUST LTD.
25 DARTLEY BANK & TRUST LTD.
26 DELTEC BANK & TRUST LTD.
28 EURO CANADIAN BANK & TRUST COMPANY LTD.
30 FERRIER LULLIN BANK & TRUST BAHAMAS LTD.
31 FIDELITY BANK (BAHAMAS) LTD.—FIDELITY MERCHANT BANK & TRUST CO.
32 FINCO FINANCE CORPORATION OF BAHAMAS LTD.
33 FINTER BANK & TRUST (BAHAMAS) LTD.
35 FRANKLIN TEMPLETON FIDUCIARY BANK & TRUST LTD.
36 GONET BANK & TRUST LTD.
—HONGKONG SHANGHAIL BANKING CORPORATION LTD.
38 HOTTINGER BANK & TRUST LTD.
42 J. SAFRA BANK (BAHAMAS) LTD.
43 LEADENHALL BANK & TRUST COMPANY LTD.
44 LOMBARD ODIER DARIER HENTSCH PRIVATE BANK & TRUST LTD.
45 M.M.G. BANK & TRUST LTD.
46 NATIONAL BANK OF CANADA (INTERNATIONAL) LTD.
47 P.O.B.T. BANK & TRUST LTD.
48 PASCHE BANK & TRUST LTD.
49 PICTET BANK & TRUST LTD.
50 PRIVATE INVESTMENT BANK LTD. The Bahamas is today one of the world's principal international financial centres, having evolved from little more than an offshore tax haven comprised of a few branches of foreign banks in the mid-sixties. The country's progressive legislation and regulatory structure, its highly-skilled workforce, and its responsive government have attracted many of the world's largest and most prestigious financial institutions. Convenient air transportation, modern infrastructure, including an excellent telecommunications system, support efficient business operations. The asset base of The Bahamas' banking centre is in excess of $200 billion, positioning it among the top ten countries in the world, behind the USA, the UK, Japan, Switzerland and others. The centre has a sound capital base. Capital-asset ratios consistently average some 11.0%, enabling it to optimally exploit profitable opportunities through the world. Private banking, portfolio management, and mutual fund administration have gained in importance in recent years, reinforcing the international community's recognition of The Bahamas as a safe repository of the financial assets of both individuals and corporations. In its role as a centre of world banking activities, The Bahamas emphasizes the quality and international reputation of its financial institutions. Over 400 banks from thirty-six different countries, including the United Kingdom, Switzerland, France, the United States, Canada, and Japan, are currently licensed to conduct business within or from The Bahamas. Many are branches or subsidiaries. 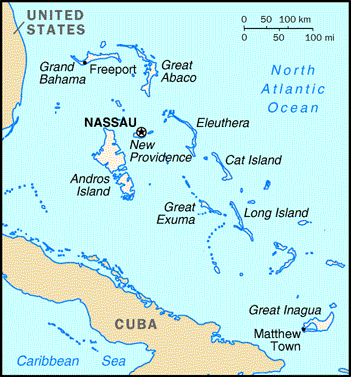 As of September 1995, 184 banks had a physical presence in The Bahamas. Licensees include a very active offshore banking community, with almost one hundred eurocurrency branches of international banks and trusts, as well as 168 Bahamian incorporated institutions. Over 60% (246) of all the banks licensed within The Bahamas, offer trust services in addition to their regular banking operations. The banking community of The Bahamas is well supervised by The Central Bank of The Bahamas, which maintains a regulatory environment conducive to investment opportunities, while ensuring the highest standards of operations and conduct, as developed by the Basle Committee on Banking Supervision. In its role as manager of the country's monetary system, the Central Bank has advanced computer and telecommunications technology. It employs a highly-trained staff, permitting it to respond promptly to requests for licences, designation of offshore trusts, and other tasks. The rigid, self-regulatory code of conduct of The Association of International Banks and Trust Companies (AIBT) also deters the use of financial operations for criminal activities and upholds the principles of bank secrecy. The other major banking institution is the Bahamas Institute of Bankers. Nassau, N.P., The Bahamas The Chase Manhattan Bank, N.A. Mutual funds have become the largest growth area in The Bahamas' financial services sector over the last few years, and the country is developing into a major international center for mutual funds. The Bahamas' tax-free and investor-friendly regulatory environment makes it attractive to fund managers seeking alternative offshore asset bases. It costs less to operate a fund in The Bahamas, therefore, providing investors with more profit. The nature of fund activity has evolved from funds being sold to international clients by private banking institutions with local branches to funds being established in the country, using Bahamian institutions to service them. The uptrend in mutual fund investment prompted the Government to pass the Mutual Funds Act in 1995, which protects investors by regulating the fund industry through a Securities Board and Administrators that license mutual funds. Applications for fund licenses must include a prospectus of the fund and provide guarantees to the board that the fund's promoters are reputable. The board's inspector has the authority to examine records of a fund, audit the fund, or act on behalf of investors if their interests are in danger. Confidentiality and privacy are assured by provisions in the new legislation. Atlantic Bank of Commerce Ltd.
Chemical Bank & Trust (Bahamas) Ltd.
CIBC Trust Company (Bahamas) Ltd.
Coutts & Company (Bahamas) Ltd.
Darier Hentsch Private Bank & Trust Ltd.
Euro-Dutch Trust Co. (Bahamas) Ltd.
Fidinam Trust Corporation (Bahamas) Ltd.
Laurentian Bank & Trust Company Ltd. Sand Ander Investment Bank Ltd. The Private Trust Corporation Ltd.
Thorand Trust & Management Ltd.
Westpac Bank & Trust (Bahamas) Ltd.